We have been an entirely volunteer-run organisation since our founding in 2014, with annual costs below $10,000. Our volunteer team has gradually expanded, and we currently have 11 members of our advisory board working to support chapter leaders at each of our 15 chapters at universities across the United States. In the last 6-12 months, as the number of OFTW chapters has increased, it has become clear that this model (which relies on people with demanding jobs volunteering a significant amount of their free time) was nearing capacity, and would soon limit our ability to expand. However, this recent growth has also made it clear that One for the World's model can be highly successful in engaging people in effective altruism and raising money for effective global poverty charities. To date, as an entirely volunteer run organization we have raised $280,000 and have annual recurring donations in excess of $300,000 in the pipeline. Therefore, in February 2018, we simultaneously started looking for promising individuals we might be interested in hiring, and for funders who might support the increased operational costs that this would entail. We're delighted to report that this search has been successful on both counts! Evan McVail started his job as COO last week, and we're very excited to welcome him to the team! Evan graduated from Villanova University in May, where he double majored in Economics and Political Science. 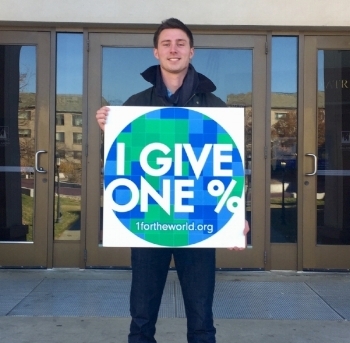 He helped found and was co-president of the Villanova OFTW chapter, which has been one of our fastest growing new chapters, signing up 89 members in its first full semester. We already knew Evan was an excellent chapter leader, and when we interviewed him, it became clear that he has a very strong passion for OFTW and effective altruism more generally, and has the skills to be a big success in the COO role. Evan had a standing offer to work for Deloitte Consulting after graduating, but Deloitte graciously agreed to defer his start date until 2019 to allow him to work for OFTW for the next year. The primary focus of Evan's role will be supporting our chapters as we expand, though he'll also help out with marketing and other general operations. We are only able to make this hire, and expand our operations more generally, because of the financial support of a private donor, Luke Ding, and the Open Philanthropy Project. Upon the recommendation of GiveWell, Luke has committed to give OFTW $51,250 and the Open Philanthropy Project has committed to give OFTW $153,750, to help fund our operations over the next two years. We expect to spend the majority of this money on hiring Evan for the 2018-2019 academic year, and on hiring a longer-term CEO and another 0.5 FTE in the academic year 2019-2020. You can see more details of our projected costs in our budget. GiveWell has written up their reasons for recommending this grant here. Broadly, they agree that One for the World has large growth potential, and that this growth requires increased capacity and investment. In making this assessment, they analysed our key metrics (pledges and donations), our November 2017 Strategic Plan, and our plan to expand to 100 schools by 2022. We're very grateful to both Luke and the Open Philanthropy Project for supporting us in this key stage of our growth, and for believing in OFTW's mission. We also want to thank The Life You Can Save for its ongoing support as our fiscal sponsor, and in particular over the last 18 months, during which it funded a large proportion of our expenses.